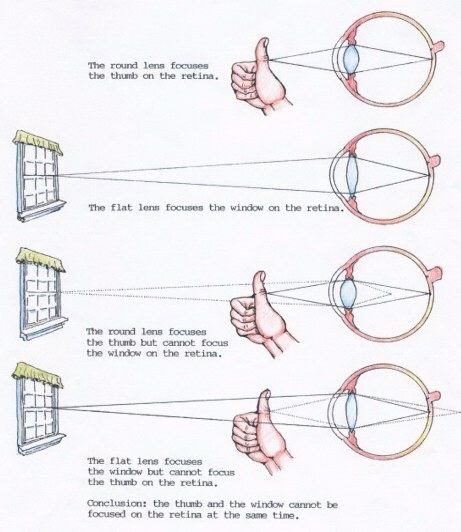 This graphic shows that when you are focused on the thumb, the lens of your eye is rounder to accommodate the short angle of distance. For the thumb, the round lens causes those rays to meet on the retina. For the window however, the round lens focuses at a point far short of the retina. For the window a flatter lens shape causes the window's light rays to meet on the retina, but at the same time the flat lens prevents light rays reflected from the thumb from focusing on the retina. It is thus apparent that the human eye lens cannot focus on the close thumb and the far window at the same time. Now if we were to place a chair halfway between the thumb and window and focus on that, we would find that both thumb and window are out of focus. This tells us that we could stand six chairs in a row between thumb and window and we would still be able to focus on only one chair, or the thumb, or the window at a time. 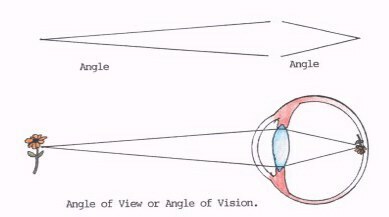 This experiment tells us that for each angle of distance there is a flatter or rounder lens accommodation that will focus that angle and no other. An angle is the shape made by two straight lines coming to a point. From thumb to infinity we can focus only one angle of distance at a time. What does this have to do with colors advancing or receding? The answer is angles! Distance has angles,.... and COLOR has angles! Let's examine Sir Isaac Newton's 1665 experiment with color angles. It will help us to understand the optical illusion of color depth.